I have some exciting news about a new judge! Amanda Beth from amandabethonline.blogspot.com has agreed to be a judge!!! I'm especially excited about this because it was her "Maid Marian's Wardrobe" event that really inspired me to do this event! I love reading her posts so be sure to become a follower of her blog if you aren't already! She is also having an event a month after mine so be sure you check that out! It looks uber fun! Amanda Flynn lives in the beautiful state of Massachusetts (less than hour from the Alcott's Orchard House), with her huge and awesome all-American family. 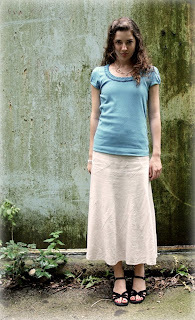 She writes and manages AmandaBeth Online - a fashion blog focusing on modesty and true beauty. Amanda has a passion for the arts and is pursing music, entertaining, writing and publishing. Louisa May Alcott is one of her favorite authors and the first one to become a major influence on her writing style. An Old Fashioned Girl is her favorite Alcott novel. 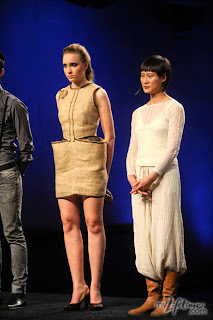 Last week on Project Runway, the age old saying "she's so pretty she'd look good in a potato sack" was tested. 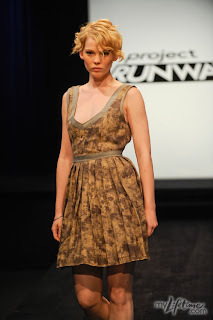 "The designers must create a party look from a burlap potato sack." This is why I love this show so much!!! What a crazy idea! But there were some AMAZING dresses made! Who should have lost, again, is Ping. I'm sorry, but I just don't "get" her style at all! And I absolutely cannot understand how she didn't get out! The dress was so short, her model's rear was slightly exposed!!! That is inexcusable in my opinion! I had two favorites in this round! First, Anna's design, I thought, was beautiful, once again. She got potatoes and actually used them to create a patterned look on a cute little dress she made. I thought I was just very cute! 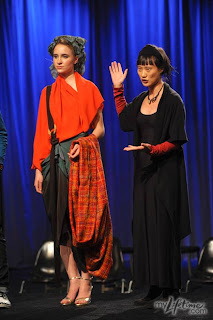 And secondly, Amy's cowl neck and "petal" skirt was genius I thought! AND the open back! The whole dress was really flattering and just beautiful! What do you think about these designs? Can you think of any designs of your own for this challenge? 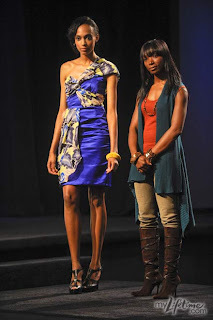 Today is my second "weekly" post about the Little Women of 2010 challenge! I've gotten so many responses from all of you about it and I can't wait to see how it turns out! I'd like to introduce you to the second judge, Morgan Hoover. I met Morgan in 2008 and have become really great friends with her! We like sew and watch historic/BBC movies together! She is a very sweet person and I'm so happy she's agreed to be one of the judges! 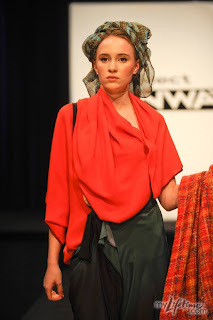 Morgan has been sewing for almost 3 years now, making costumes for herself and her sister for the plays Robin Hood, Little Women, Fiddler on the Roof and for a reenactment ball. She loves anything having to do with history and is thrilled to have been asked to judge. As for any changes I've made to the event...the only thing I can think of, is that I'm opening up the "Little Women Photoshoot" category to include not only "historic" inspired, but can also be a "modern" version, as well (for those of you who don't actually own 1800's costumes). I am SO excited about my newest purchase! I got a ukulele on Tuesday and I already have calluses and can play "Over the Rainbow!" :) The uke is such a fun and easy instrument! I've had such fun picking out chords to songs! Another fun song is "Tonight you belong to me". If you've never heard it you can look it up on iTunes...it's so cute! I have started writing a book! I finished a Civil War play several months ago that I had been working on for a couple of years, and I felt like I needed to be writing something else (no, school essays don't count). So I started putting onto paper an idea that has been in my head for a while! I'm really excited about it! Fiddler on the Roof rehearsals are going well! :) We've been running through the music and we read through the script! We're going to start choreographing "Tradition" Thursday and I'm really excited about that! I've also been over at my friend's blog: http://storyofaseamstress.blogspot.com/ and she's been posting different quizzes to take telling you which character you're like in different movies and such. I got "Prince Turveydrop" (don't ask, I don't know why!) when I took the Bleak House character quiz...and "Maid Marian" (this is a bit more fitting, I'd say) for the classic heroine quiz. So head over there and see who you are most like! 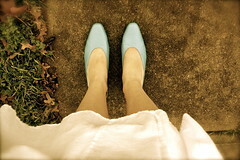 I also did a very mini photoshoot with my feet the other day that I had been meaning to do forever! And my most important news! 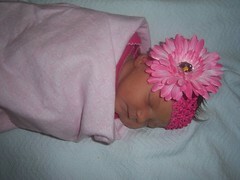 Baby Piper, my new little niece, was born on Wednesday!!! I've decided to each week make a post about the Little Women event that's coming up next month! Today, I'm going to introduce one of the judges who will be helping me decide finalists for the categories I announced. 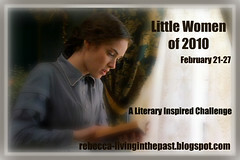 If you haven't heard about this event you can go to this link: http://rebecca-livinginthepast.blogspot.com/2010/01/little-women-of-2010-literary-inspired.html and read all about it! I'm also going to announce a few changes I've made about the categories you can enter. Anyways, let me introduce one of the judges for the event: Atlanta Shannon. I met Atlanta May of 2007 at a reenactment. Since then, we've becoming very close friends. She taught me all about sewing and authenticity and such and I owe all my knowledge about reenacting and sewing to her. So, I though she would be a perfect judge for Little Women of 2010! "Atlanta first began sewing in 2004, making outfits for her family to wear for their first 1860s reenactment. Six years later, after countless modern and historical sewing projects (some successful and some not :^) she still loves sewing and history more than ever. She said that she is flattered to be asked to be a judge for Little Women 2010, and can't wait to see all the lovely entries!" Also, I'd like to tell you about some changes I made regarding the categories to enter (I've made the changes on the original blog post, but I wanted to make sure I let everyone know about them)... I've made a few adjustments on the first category (new description below) and i've added a new category that was suggested by a few of my readers. I also would like to clarify that you don't have to have three sisters to participate in these challenges! I'm *ahem* attempting a project that I've been meaning to do for some time, but I've been super nervous about. 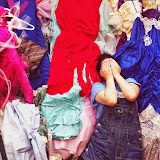 I've made dresses, coats, almost every sort of clothing article, but making curtains scares me half to death! Maybe it's the fact that they're so big, long, made of really nice fabric...I don't know! But I'd honestly rather be making a renaissance ball gown than curtains! I've had my fabric for months and months, and it's just been sitting in my room. Waiting. Wishing. And making me nervous. They'd still be there right now...if I hadn't gotten the nerve to make them today. The fact is, I haven't had any window covering for *ahem* months...and that was fine, until I started having terrible nightmares about creepy people staring at me at night through my uncovered windows. So...here I am. Determined to make them!!! Any suggestions????? I need encouragement!!!! HELP! Little Women of 2010 - A Literary Inspired Challenge! I promised to do something special in honor of my 30th follower and I definitely intend to keep my word!! Several of you participated in Amanda Beth Online's "Maid Marian's Wardrobe" event. Well, Amanda has inspired me to start my own event on my blog. I am very excited and can't wait to hear your thoughts about my creative challenge! 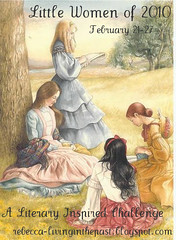 The story of Little Women has inspired many young girls for over 150 years! Each character in the story is unique, but so similar and real to us, even in 2010. There are even quizzes that you can take to see who you are most like: Meg, Jo, Beth or Amy...but most of us already know which character we relate to the best. Because Little Women has been a loved story through the generations, I couldn't think of any better story to create this event for, than that of the four sisters we all know and love. 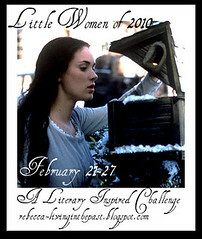 Little Women of 2010 - A Literary Inspired Challenge will be a week long affair lasting Sunday, February 21st to Saturday, February 27th. During the event I will be posting pictures from different Little Women adaptations and I have a few plans up my sleeve. I am very excited about this challenge! I have lots of ideas about how you can participate in different categories having to do with Little Women! I'm hoping that quite a few people participate in this event and are able to show the world that the story of those four "little women" still lives on today! Please post comments and ideas for this event! I really want to know what you think! 3. Little Women Photo shoot - I love photography and being able to capture character with just a click of the camera. So for this category, have a photo shoot with you and/or your sisters in the 1860 style. You can even be in character as the March sisters. Be creative! I can't wait to see what you think up! For each category, simply create a post on your blog and I will have a place where you can leave a link to your post. Saturday, February the 27th, I will close the contest and three judges (me included) will look at all of the posts and judge based on creativity and originality. We will choose the finalists for each category and then allow the public to cast their votes. I cannot wait to see what you come up with! So please help me promote this challenging event! I have some banners below that you can add to your blog or website. If you are interested in participating make sure you have added a banner to your blog somewhere! Click on the picture and it should bring up the flickr photo page. Click "all sizes" and you can download the small size and save it to your computer and upload it to your site. Also, you can post about the event and let all your friends know about it! Just make sure you leave a link to this post. I have some really exciting ideas for this event and I cannot wait! So get started thinking about which categories you are going to enter! I just know it's going to be a very fun event! I don't know about you, but 2009 was a crazy, full year! I've been reminiscing and I just can't believe what all happened, just in my life, in only one year. At the beginning of the year, my dad was in Iraq and it was just me and my mom and sister at the house. We were ready and expecting to go through a whole year by ourselves. However, as I'm sure everyone already knows, if you want to make God laugh, tell him your plans. In February, we heard that my dad had been flown to Germany and was going to have heart surgery. He just happened to mention a small pain in his chest and a few days later is was discovered that he had 90% blockage in one of his arteries. Thank the Lord it was found before he had a heart attack! So my mom and I left Michelle with friends and flew to Germany the day after we found out. How strange to be going along with my daily life, find out my dad is having heart surgery, and fly to Germany the next day! Praise the Lord the surgery went well, and he began to recover almost the next day! While we were there, we discovered a train that could take you to Paris, France in 2 hours, and we planned a one day trip there! I still cannot believe I actually saw the Mona Lisa and the Eiffel Tower! When we returned (with my dad) my mom and I started work on "Robin Hood". JOY Christian Academy's first production...and my mom's first play to direct! I also began rehearsals for "The Sound of Music" at a different homeschool co-op. The next few months were filled with theatre and school...I was a sophomore and taking one of the hardest math classes EVER (Algebra 2), along with Worldview, art, and voice. "Sound of Music" was put on in March and the post production party was on my 15th birthday, March 21st. After which, I heard about another musical being put on at the community theatre a few miles away from my house. I was asked to join and I became part of the company. The 4-H event happened around this time, and I entered several photographs and dresses. I got three 1st place awards in photography, a grand champion award, and two went to state. I also got a first place prize on my white sheer dress that went on to district where I got second place. "Robin Hood" and "Annie Get Your Gun" rehearsals were almost back-to-back. When May rolled around my head was spinning, but I was loving every bit of it! After both plays were over I was definitely ready for summer!!! During summer break I got to do some pretty neat things...my favorite was hanging out with friends! I also got to be a part of "Snow White"! That was oodles of fun! Once school started up again I was completely involved in classes and "Little Women". "Robin Hood" was such a huge success we decided to do another production! Along with "Little Women" I was also involved in an advanced show choir group called Triple Threat Texas. The semester was filled with lots of homework and LOTS of sewing! I was in charge of all the "Little Women" costumes which was a huge responsibility! :) But SO worth it! As the end of the year has come and gone, I like to look back on everything that has happened. I love to laugh at how I thought the year would be like...and at how it ultimately came about! God has had such a huge part in my life this past year! So, I challenge all of you to look back at how your year was...did everything happen like you thought? What kinds of surprises happened to you? How do you think this next year is going to be like? God bless! And have a very happy new year! Go here to enter a giveaway for some cute stuff!